A new phenomenon, urban heat islands in Jaipur indicates that the city has begun to witness the worst of climate change. This summer, Jaipur’s temperatures are soaring upwards of 40 degree Celsius. Jaipur witnessed its hottest day on April 26 when a temperature of 43.2 degree Celsius was recorded. Of late, at least some parts of the city are beginning to exhibit signs of climate change typical of large cities. With more concrete and asphalt replacing natural vegetation, “urban heat islands” are becoming a reality and Jaipur is a good example of this. Urban heat islands are pockets of densely populated areas in a city where temperatures are higher than the rest of the city, thanks to packed residential areas and networks of paved roads. Heat trapped by tarred roads and dense clusters of buildings, on an average, add about two degree Celsius to the temperatures in the city, as per a study on urban heat island effect over Jaipur city. Studies also indicate that the city is likely to experience the worst effects of climate change in the future. Studies on Jaipur’s land surface temperatures indicate that the most urbanised areas are the hottest. The coolest are those with the largest amount of preserved vegetation. A study by Rupesh Gupta to understand the zones that have the potential to be urban heat islands shows that Jaipur has been expanding very rapidly towards the south and the south-west due to the presence of the Aravallis—Nahargarh and Jamwa Ramgarh hills in the northern edge and Jhalana hills in the east. Studies have been done to quantify the intensity of urban heat islands. As per Gupta, 13.12 percent of Jaipur’s area is under moderate urban heat island potential zone and 0.97 percent is under high urban heat island potential zone. The latter is located close to the walled city in the core region, which is a high density built-up area and the central business district of Jaipur. Another study by Seema Jalan and Kavita Sharma on the urban heat island phenomenon in Jaipur city, states that over a period from 2000 to 2011, Jaipur has witnessed considerable growth in the built-up area at the cost of greener patches. This has had a clear impact on the variation in land surface temperature. There has been an average rise of 2.99 degree Celsius in overall summer temperature. New suburbs of the city record two to four degree Celsius increase in land surface temperature. This is inversely related to a change in vegetation cover and positively related to the extent of the built-up area. The study concludes that urban heat islands of Jaipur city have intensified and extended over new areas. Timelapse of Jaipur city on Google Earth Engine from 1984 to 2016 clearly indicates the change in land use especially in the southern, south-western and western parts. This radical alteration of land-use pattern has created microclimates where heat islands have developed. The city was founded in 1727 by Maharaja Jai Singh-II by relocating from the then capital city of Amer, located nine kilometres north of Jaipur. Amer experienced water scarcity and was also constrained for growth. At that time, Jaipur, spread over 6.7 sq km, was planned to support a population of 1.5 lakhs. “The city (Jaipur) is bound to expand spatially in the coming decades to accommodate its growth,” says Neeraj Tiwari, senior town planner, Jaipur Development Authority (JDA). Effective land use planning is critical considering the Jaipur Development Authority’s Master Plan, 2025 projects a population growth of 5.3 percent annually. “Jaipur city will have a population of approx. 65 lakhs and a total of 75 lakhs including satellite towns by 2025. The masterplan 2025 has provided for 11 satellite towns and four growth centres within the Jaipur region. It has allocated around 2940 sq km of land under the proposed land use,” says Tiwari. “Not just urban heat islands, Jaipur is also faced with the problem of urban sprawl and the deteriorating quality of urban life. The city’s core areas which are under the authority of the Jaipur Nagar Nigam are seeing densification, inadequate supply of open spaces and amenities,” says O.P. Sharma, technical assistant to senior town planner, JDA. “The city has been seeing what is called unregulated ribbon development where residential and commercial areas come up along the routes of communications radiating from a human settlement, increasing problems of inadequate infrastructure. The spatial growth of Jaipur is amorphous in structure mainly along and between highways,” says Sharma. Like most other master plans, Jaipur too has a centralised approach with a compact urban area which serves as the nucleus of development. Water bodies are known to mitigate the effects of urban heat islands. As per a study by Sunita Sharma on water bodies in Jaipur, over 50 percent of the water bodies have not only dried up but have been lost to the real estate mafia. 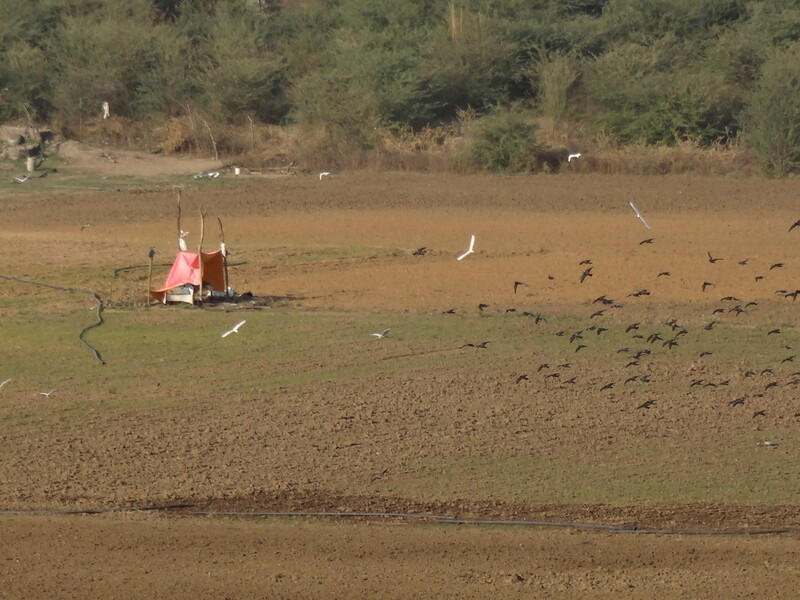 Another study by Kathleen Roberts, Michael Reiner, and Kimberly Gray of Northwestern University (2013) states that although Jaipur receives only an average of 600 mm of precipitation per year, mostly in the monsoon months of June-September, management issues exacerbate its water scarcity challenges. The city has lost as many as 150 of the 518 rivulets originating from the Aravalli hills and urban development has taken a toll on Jaipur’s hydrology. Many natural streams began to be used for dumping garbage and have been blocked or filled for construction purposes. The city needs to improve its water management, recharge its groundwater and rejuvenate its seasonal rivers like the Amanishah nallah. The urban architecture in the city with its growing vertical rises can change wind patterns and intensify the sensation of heat. The increasing use of concrete, asphalt, glass and metal in the city’s buildings is likely to absorb and retain more heat than a neighbouring rural area. Some believe that it could absorb twice as much heat. “Cities world over are losing their rural features that mitigate surface and air heat. They do not have exposed soil, grass and trees that create shadow zones. The city landscape is now dominated by heat-trapping materials that prevent its cooling through evapotranspiration. Cities need to go green,” says Tiwari. “In foreign countries, asphalt is being painted white so that the black asphalt street does not work like a heat sink. I do not think that system will work in Jaipur because we Indians do not maintain cleanliness,” says Prof. Prithvi Singh Kandhal, who had helped the Franklin Institute of Philadelphia (USA) develop porous asphalt pavement technology for its parking lots. Often building materials are to blame. The notorious Walkie Talkie skyscraper in London has a concave glass facade which converges and reflects so much heat that it even melts parts of cars parked in front of the building. “We need better architectural plans and materials for buildings to prevent the formation of such heat islands in our cities. Modern residential and commercial buildings need to use eco-friendly materials. Else, this trend may aggravate the existing heat island effect in the cities in the near future,” says Sharma. The Green Building Congress 2017, an international conference that hosted delegates from 31-member countries of the World Green Building Council (WGBC) was held in Jaipur in October 2017. “Barring a few buildings like Manipal University, the city does not have role models for green buildings. This, despite the fact that the Rajasthan government is committed to promoting green building norms in the state. The JDA has introduced incentives like five percent additional floor area ratio (FAR) at no cost for projects under its ambit. Yet, not a single project has come up to the JDA for approval as a green building,” says Tiwari. “The JDA is not aware whether the Indian Green Building Council (IGBC) has registered green building projects in the city,” says Sharma. This indicates that better coordination is needed between various agencies to improve Jaipur’s green building footprint. More incentives should be given to project developers and architects considering green buildings often cost more to construct.